Almo Nature's Rouge Label the Alternative is no longer available. We recommend Almo Nature Alternative - Cat Food as a very suitable alternative. This tasty food is prepared using a single protein source, a single fat source and a single carbohydrate source that contains 50% (fresh) meat. In addition, all of the ingredients used are fit for human consumption. It consists of 50% fresh meat from a single protein source. The only source of carbohydrate is rice, a highly digestible source of carbohydrates. To make one kilo, we use 850 grams of raw meat, 800 grams of rice, potatoes, peas, fats, vitamins and minerals. At the end of the process the product is 50% freshly prepared meat, which is prepared daily. From January 2014 the amount of raw meat will be increased to 1,100 grams. This means that, at the end of the production process, 65% of the product will be made of fresh meat! Additives with no nutritional value. High digestibility (reduction in the use of enzymes). Dogs of various breeds, ranging from 2 kg to more than 60 kg, have different nutritional needs. Here at Almo, we have calibrated the protein/fat ratio to suit the needs and metabolism of various sizes. Besides this basic difference, the shape and size of the chunks has been calculated according to the size of the dogs. These differences are covered by varieties XS, S, M and L.
Especially for small dogs, Almo Nature has developed EXTRA SMALL (XS) and SMALL (S) varieties. XS is for the smallest dogs weighing up to 5 kg. S covers dogs weighing 5 to 12 kg. Both XS and S foods come in three flavours: chicken, salmon and lamb. Please note: XS can only be ordered in 750 gram size. S is available in both 750 grams and 3.75 kg. For medium-sized dogs weighing from 12 to 30 kg, choose MEDIUM (M) chunks. Again the flavours that can be ordered are salmon, chicken and lamb. Please note:All flavours of the M chunks can only be ordered in the 9.5 kg size. Large Dogs (L): The biggest dogs weighing over 30kg are not excluded from Rouge Label. For them, LARGE (L) foods are available in three varieties: salmon, chicken and lamb. Please noteAll flavours of L food are only available to order in the 9.5 kg size. 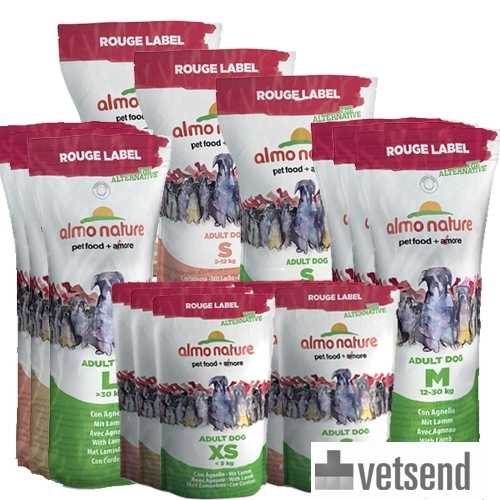 Have you used Almo Nature - Rouge Label - The Alternative before? Let us know what you think about this product.